Becoming mindful teaches you that the nothing is the same twice. Each breath we take is different and though it might seem the same each cup of tea that we drink is subtly different in multitude of tiny of ways. Same for those regular meals that we cook week in, week out. So what has this got to do with leftovers and frittata I hear you ask? The same is true for portion sizes also. 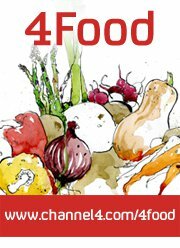 Cooking and eating mindfully includes deciding how much is enough today. Not the amount that’s usually enough or what worked last week but what seems enough today, at this particular one-off mealtime. 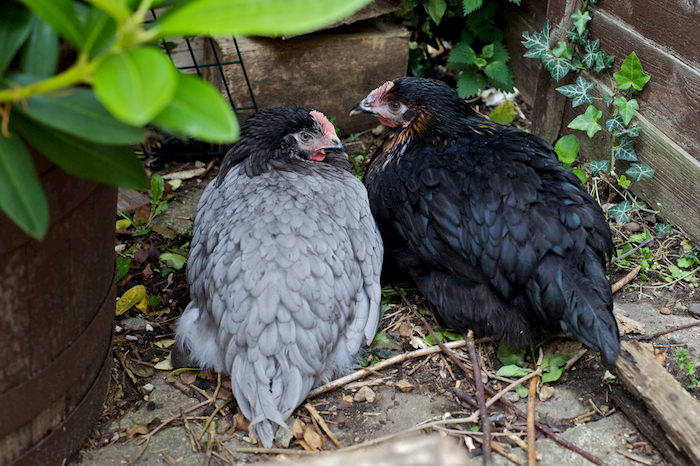 With these two lovely new chickens taking us up to five girls in total, we’re regular frittata eaters in our house. The recipe I’ve posted below is for the amount that I always make. It’s a variation on this ever adjusting Parsnip, Red Onion, Kale and Gouda frittata which in turn is from this basic frittata recipe. I am forever indebted to Kathryn Elliott for pointing out the simple beauty of a frittata for those days when you don’t have anything planned. So long as you have some eggs, an indiscriminate assortment of vegetables and a few scraps of cheese then you have dinner. 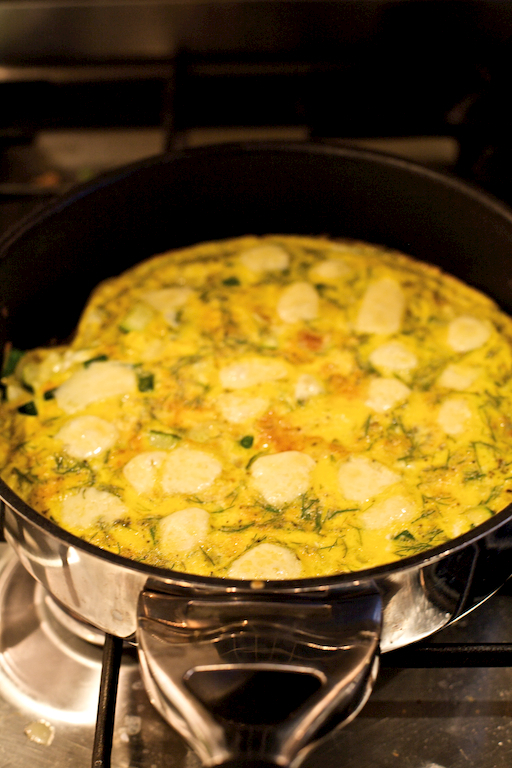 A 6 egg frittata isn’t the right portion for two people every time. Sometimes it’s just perfect, other times it’s a bit too much. Which leaves the happy accident of leftovers for breakfast or lunch. Sometimes enough for two people, sometimes enough for one and sometimes none at all. This post is for Helen’s Breakfast Club Event, hosted by Monica at SmarterFitter. As I’m a big fan of Monica, Helen, breakfast and leftovers I thought I’d join in! Substitute other cheeses or veg as you please. We like this with a green salad. Turn on your grill (broiler) to warm up first if you would like to brown the top of your frittata before serving. Warm the olive oil in a deep-sided frying pan over a medium heat. Add the garlic and cook gently for a few minutes until softened, taking care not to colour the garlic. Add the courgettes to the pan and cook gently for another 5 minutes, or until softened. Season the eggs with black pepper. Turn the heat up to medium/hot and add the seasoned eggs, the dill and then the cheese. Cook for 1 minute. Reduce the heat and cook for a further 5 minutes or until the eggs are set. Optional: brown the top of your frittata under the grill until golden. Eat as much as you need and save any leftovers in the fridge for breakfast or lunch tomorrow. I am always delighted when I see a new post from you in the feed reader Sophie, and I so happy you have taken part in Breakfast Club this month! Love frittata. I now just need to move to the country and have my own hens! Thanks Helen – my inner dietitian and foodie both approve of a good breakfast! Egg dishes are a personal favourite of mine. They are extremely easy to make plus they never go wasted. They are also good for breakfast and brunch. By the way, this frittata looks yum! I read this post for the first time on Monday morning, coincidentally soon after I’d eaten my breakfast of scrambled eggs to which I’d added crumbled feta cheese and freshly shelled peas — which may sound like an odd vegetable addition but I’m harvesting them daily from my garden and eating them daily. I do appreciate your insight on mindfulness and portion sizes. Very wise. Thanks Adam, the frittata was lovely. We always have lots of eggs as we have chickens and they are an ultimate healthy convenience food. Elaine, scrambled eggs with feta and freshly shelled peas sounds absolutely delicious! Did you cook the peas or just stir them through to warm in the scrambled eggs? Just warmed – that’s all they needed. As an addition to eggs was a great way to use the first peas of the season as only a handful was ready to picked each day.